Super Bowl is all about finger foods. Easy appetizers you can pick up and pop in your mouth. This year I wanted to do something a little out-of-the-box. Fancy, yet simple. Not too complicated, yet super delicious. I settled on spicy Ahi poke and piled it high on crunchy rice crackers. This appetizer is seriously delicious. And to make it more Super Bowl-y I'm serving these little guys on my DIY field tray. La la la love! Scroll down for the recipe. 1. In a medium size glass bowl, combine cubed Ahi, soy sauce, green onions, sesame chili oil, and sesame seeds. Mix well. Refrigerate for 2-3 hours before serving. 2. 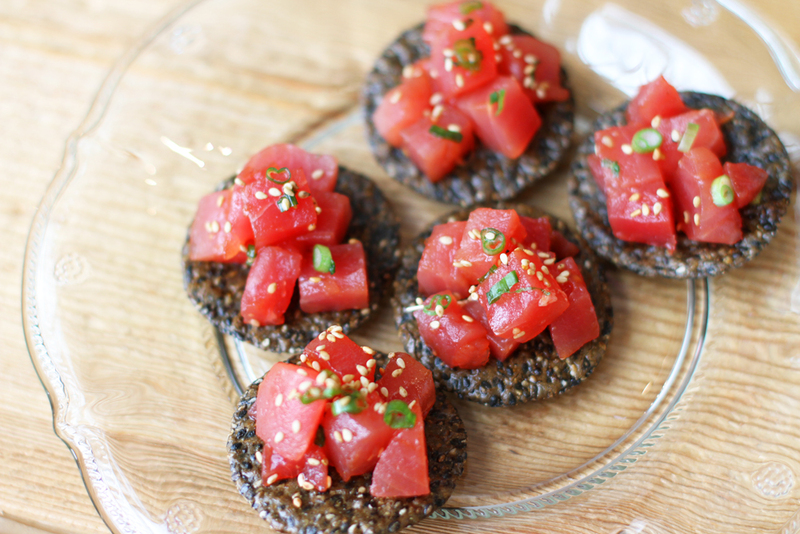 Spoon some Ahi tuna on each cracker and sprinkle with a couple extra soy seeds and/or chopped green onions for looks. Serve immediately! © Copyright 2019, Lilyshop Inc. All rights reserved. jessiedaye.com is part of Lilyshop Inc.